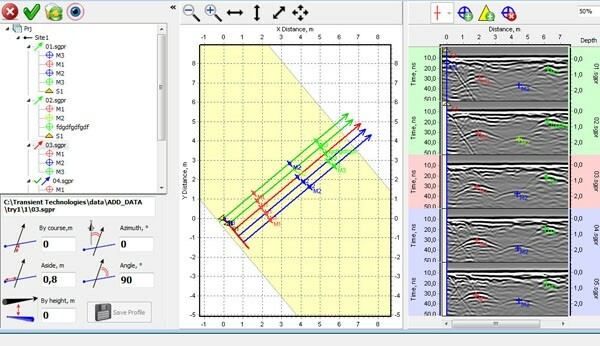 VIY3 software package allows user to set up all features of VIY3 GPR, to control the measurement, to upload data to the computer, to save data, and to process and print all measured data. The catalogue contains the short technical data about all our products and accessories. This user manual includes principles of VIY3 GPRs setup and control, connecting of all additional equipment, user manual for the software and principles of resulting data processing. 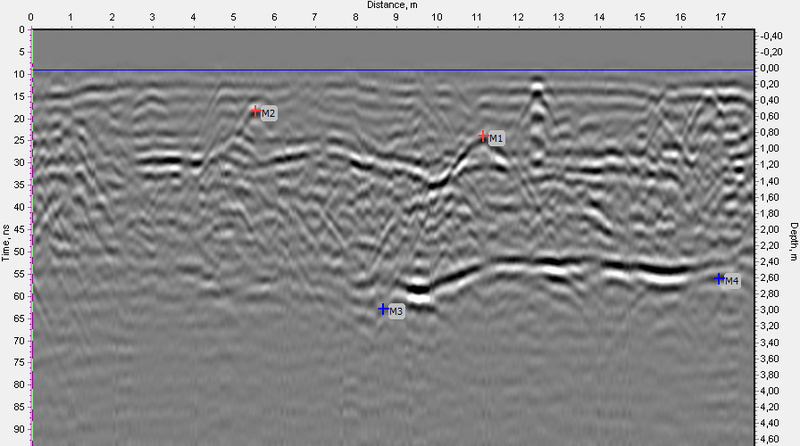 Synchro3 is the main program for GPR control and post-processing of collected GPR data. Synchro3 may work independently or together with Planner program. Planner program was developed to work together with Synchro program as a useful tool for GPR profiles representation on a location's plan, to build 3D View of GPR data, and to create reports. Below you can find some examples of Planner projects. The projects include GPR data, reports and 3D data representations. GPR data were collected after an investigation, that had place on the territory of Kiev Pechersk Lavra (Kiev, Ukraine). We made an examination of underground passages and communication lines network that go through the monastery's garden (the place is marked on the map by red arrow). 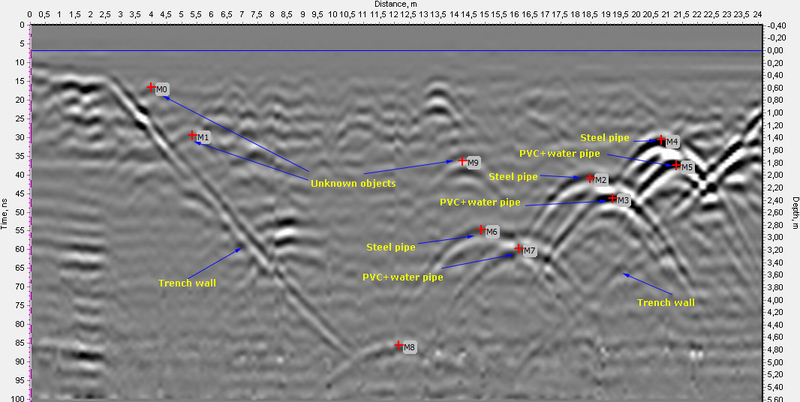 In this example you can find the set of 26 GPR profiles for Planner program. The location of the underground pipe lying on 1.5 m depth is marked on the plan by markers. You can open every single profile in Synchro software for more detailed examination and additional processing. This is possible to do directly from Planner. You can also find reports of Planner software (top view) and 3D report in the archive folder. There was led a research for remains of a water pipeline before telecommunication cable installation. 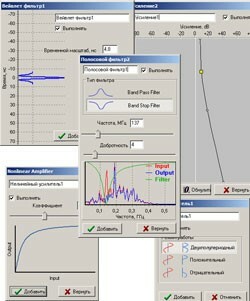 As you can see in this example, the amplitude of the pipeline reflection is getting faint since 23th profile. That might be concerned with changing of soil content on a shallow depth. In this area the soil was contaminated with garbage containing different small metallic parts. That could lead to screening in this zone. Also you can see 3D representation of GPR sounding results. 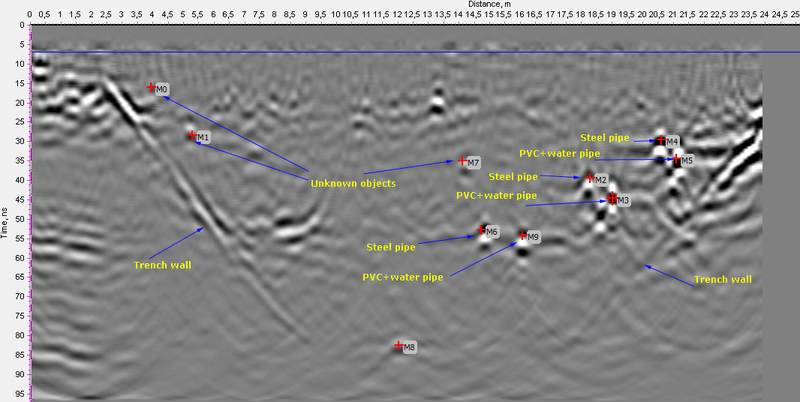 This is an example of GPR survey that was led on a sand-pit. In an archive folder you can find profile files and two pictures: original screenshot of the profile and a screenshot of a profile after Topographic correction applied. The goal of the sounding on this location was meant to find buried utilities. You can see them marked by markers on the profile. Also you can see fire-reservoir buried on a depth of 2,5 m.
On this profile you can see several objects that are located in a wide trench. The left border of the trench is seen as a slant line going from 3rd to 12th meter of the profile. The right border of the trench can be traced from 16th meters until the end of the profile. Local objects in the form of diffraction hyperbolas are marked with red markers. Brightness of hyperbolas depends on the differences in dielectric properties of the objects and the medium. Objects are discernible up to 4 meters depth (with the wave speed 107 meters per microsecond).